Warren’s Power Washing Celebrates 10 Years! July is a month of celebration for the team at Warren’s Power Washing. Jason Warren and his company are celebrating their 10-year anniversary of serving the Central Florida areas of Marion, Citrus County, and the surrounding areas. Since the young age of 16, Jason Warren has been working to better himself and those around him. He started out in the restaurant business and was quickly promoted to management at a young age. He continued to grow and hone his management and customer service skills in this industry for many years. Jason is passionate about working with people; making sure they have a great experience. When Jason was in his 30’s, he felt the restaurant industry was taking too much time away from his family. He realized he wanted something more – something that would support his family while allowing him to be there for all the precious memories he was missing out on. One day Jason had an encounter that would change his future. A gentleman started a conversation with Jason that would lead to a changed career path. He told Jason that he had a business opportunity he was ready to sell, and Jason took the steps to purchase it right away. Starting out with a small 4 x 8 trailer, one pressure washer, a hose reel, and a handful of customers, Jason turned this man’s hobby into a bountiful career creating Warren’s Power Washing. Jason looks back on his journey with memories that he wouldn’t change for the world. While there were lean times and he wasn’t sure where the funding was going to come from, his faith and family helped him to make it through. Through 10 years of hard work and dedication, Jason has not only been able to support his family financially, he’s been able to be present for all his family’s important events. He has coached Little League ball for his twin boys for several years, watched his daughter win Dunnellon’s Queen of the Rainbow, graduate high school, be awarded a college scholarship, and has been involved in all their school and extracurricular activities regularly. Jason says, “I made a promise to my family to not squander what I was given. I’m blessed to be more active in my children’s lives every day because of that one encounter”. Warren’s Power Washing now serves all over the area including Marion, Citrus, Alachua, Lake, and Sumter Counties. With multiple teams, they service both commercial and residential properties with roof cleaning, soft washing of exteriors, detailed concrete cleanings and safe pool enclosure cleanings. Their reputation for stellar customer service, top quality work ethic, and long-term success speaks for itself. Contact Jason Warren and his team today 352-489-3339 to see how they can help you bring your home back to life with their safe, pressure washing services. 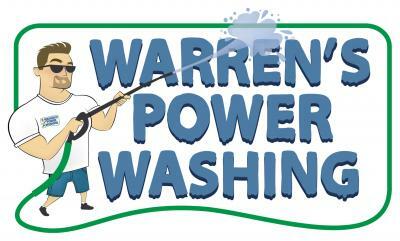 Visit www.WarrensPowerWashing.com for more information. Jason wishes to thank all of his clients, both past and future, that have helped him reach his dreams while taking care of his community!